@PippyPie, even if it's shjt? @PippyPie, as long as they dont go back to that style they had in like the late 2000's where they got all preachy about everything. Dammit I turned this on to watch Homer be stupid and hear offensive jokes, not some lesson on teenage angst. @PippyPie, I don't think anyone could really say they still like the Simpsons after they tried to do "viral videos". @CoolGuy10002, what now? Was that an episode? @Not him again, I think they released a video on their official channel of homer doing the harem shake. @CoolGuy10002, oh no. Yeah that garbage can also be included in my above comment. If simpson can predict the furture, does it mean we are coming to an end as well? @Chick33n, everyone was scared about the Mayan calendar ending, but this is the true prophecy of the end of times. @Chick33n, When the Simpsons come to an end, the crucible of the end shall begin. A calamity of untold destruction will destroy this mortal plane. We are no match against the darkness coming. As the universe's light is finally snuffed out, one final "d'oh!" will echo into the Void. Simpsons most likely won't end until either the voice of Homer, Marge, Bart or Lisa pass away. 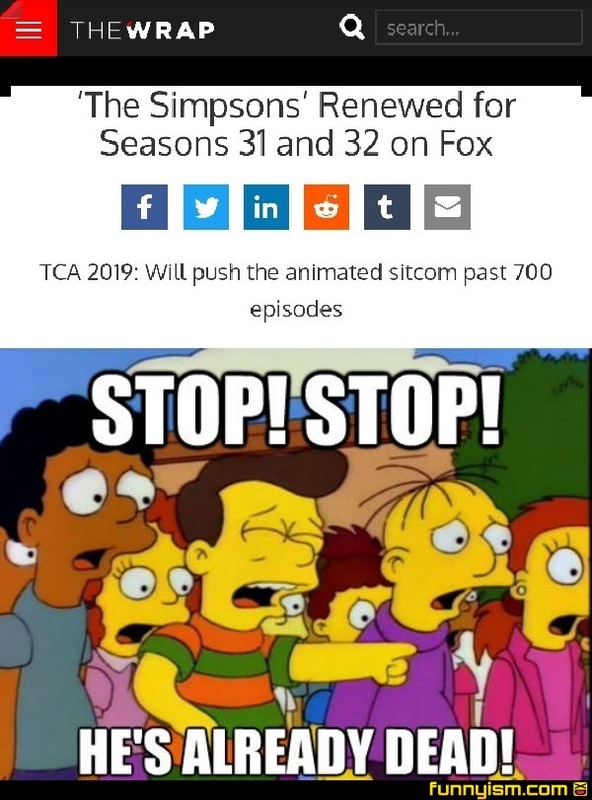 Does it not have 700 episodes already? Too wholesome for me. I like my comedies as dark as my soul.